We didn’t really know what to expect from Aegean Air. Since I’m such a paranoid flyer, I did a lot of research into them before we bought the tickets, but I still couldn’t help but worry. It was all completely unnecessary. Aegean Air is part of the Star Alliance network (the same that Air New Zealand is part of) and it felt like we were flying Air NZ. The plane was the same, the air hostesses beautiful, a free beverage and to top it off – a free cookie! This was all for around 29 euro – an absolute bargain. The flight was about one hour long from Corfu to Athens and we were back on the ground in no time. To get the cheap airfare, we did have to make a compromise. That compromise was timing. We didn’t get to Athens until about 9.30pm at night. Being tropical weather though, being out that late didn’t matter, and it was cool arriving into the heart of Athens at 10.30pm to find a pumping, buzzing city. We took the airport train and hopped off in Syntagma Square, which ended up being only a block from our hotel. Random dogs were everywhere (the city cares for them), people were playing music and walking around with their ‘freddos’ (coffee drinks) and the shops and restaurants were still all go. Sometimes it’s nice to be out in a city so pumping, it reminds me that I’m still only 26, even if I feel a lot older! We arrived at the hotel and settled in for the night after a snack of chocolate from the numerous newsagent stands that are littered around Greece (much to our delight – they seem to be set up for locals and so are really reasonably priced.) We were staying at Athens Diamond ‘hoMtel’ which was a boutique type hotel in amongst the shopping area. I booked it fairly last-minute but it turned out to be a great choice, and much more reasonably priced for what we got than what was listed in the Plaka tourist area. We woke early for our free breakfast, which was on the roof top terrace. My favourite thing about the Greek breakfasts had to be the melted chocolate that I would dip the croissants into – I highly recommend that delight when visiting Greece. You’re on holiday after all! Most people at the breakfast were Australian. We ended up chatting to a couple in their 40s who were visiting from Queensland. The husband thought I was Australian at first, when I said I was a kiwi he ended up saying his wife was too. We seem to come across that scenario quite a lot! It was great to have a quick wee chat with them before heading out for the day. At 9am I had organized a tour with ‘Athens Walking Tour’ that I found reviews of on Trip Advisor. I ended up booking the tour through viator.com as they had a 10% discount coupon one day – so definitely keep an eye out for that. We met at Syntagma Square underground station, which we were already familiar with from the night before, so that made life easy. After everyone arrived, we split into three groups of around 15 people in each group. Surprisingly, the tour actually started in the underground. When they were excavating the tunnels for the underground network, they discovered a whole other world. There were varying layers of graves over the centuries, old river beds, artifacts and housing. It was fascinating coming from countries founded so many years later to see all of the history laying under established cities. The first stop was the Parliament grounds to watch the changing of the guard at the Tomb of the Unknown Soldier. 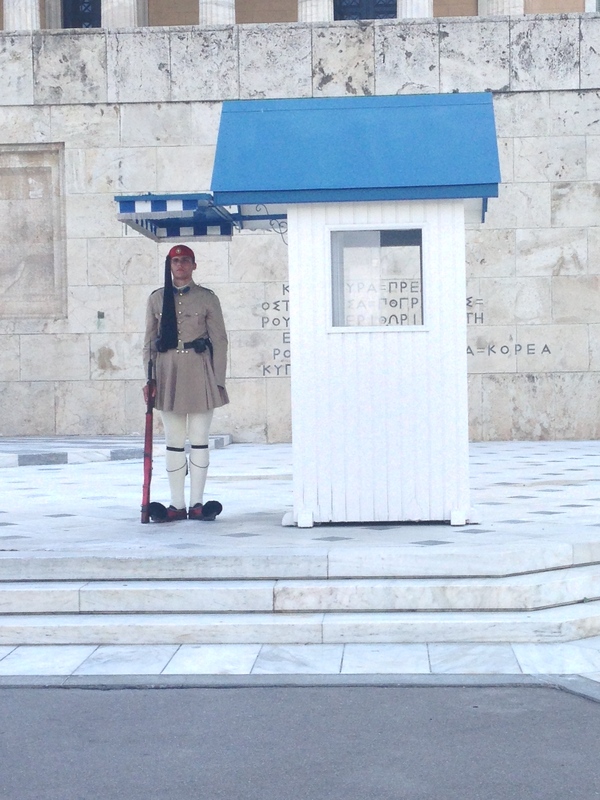 Their uniforms are highly decorative and to be part of the honor guard is a highly prized position to have in Greece. 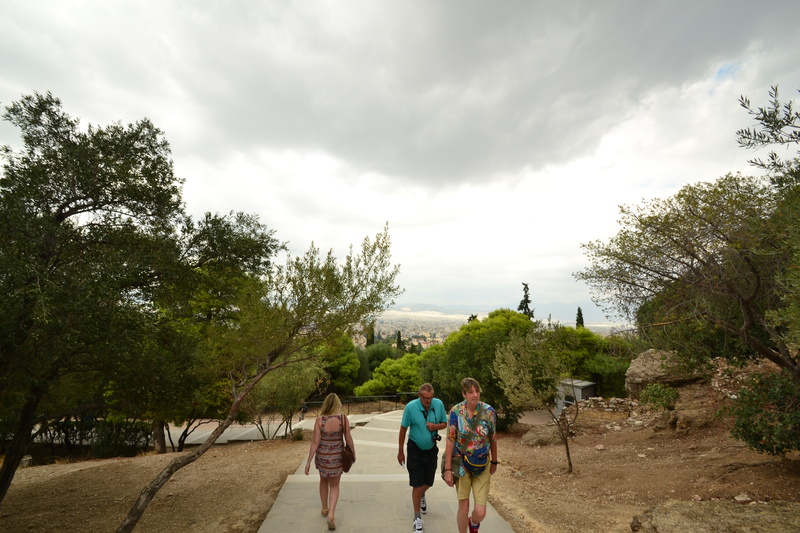 Second stop was to the National Gardens in the center of Athens. This garden was commissioned by Queen Amalia and was originally only for the Royal family. It opened to the public in the 1920s and is beautiful. Many of Athens elderly inhabitants were in groups chatting away on the benches, obviously enjoying the tranquility and break from the bustling city. It is said that during the heat of the summer, the gardens are 10 degrees Celsius lower in temperature than the city itself. Finally, it was time to see some ruins. We stopped first at Temple of Olympia Zeus. I loved Classical Studies at school. My favourite topic was always Ancient Greek mythology. Their stories and myths were always so much rawer than Roman mythology. I could see why the deities were both feared and honoured. The Temple of Zeus was a little worse for wear, but, it was still awesome to imagine what it once would have been. I loved finally seeing these ancient structures up close, even if most of the columns had already fallen (and been pillaged by Christian warriors). Last stop was the stop we had all been waiting for. 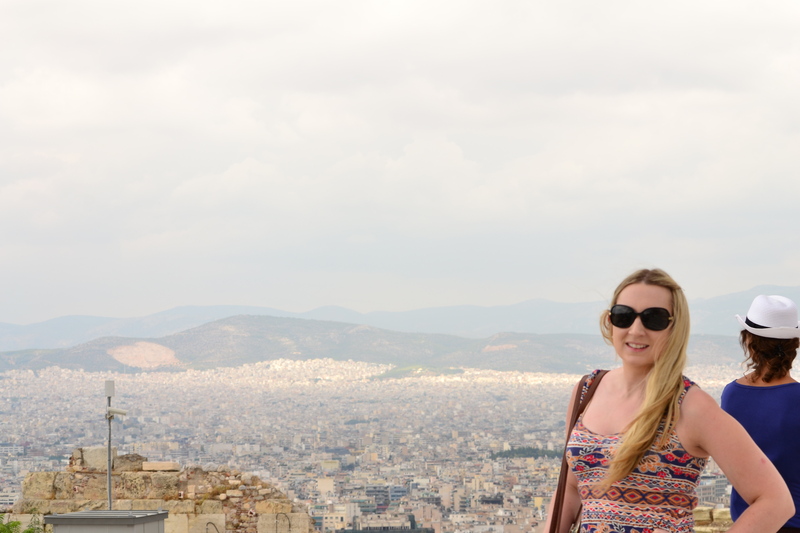 A guided tour through the Acropolis. The tour I had been waiting for since I was a teenager. I highly recommend using some kind of tour guide for the Acropolis. It’s difficult sometimes to try to picture the past, especially if you don’t have any background knowledge – or that knowledge is dated back to high school like me! We were met by some other members of the tour company who were trialing some new technology for the tour. 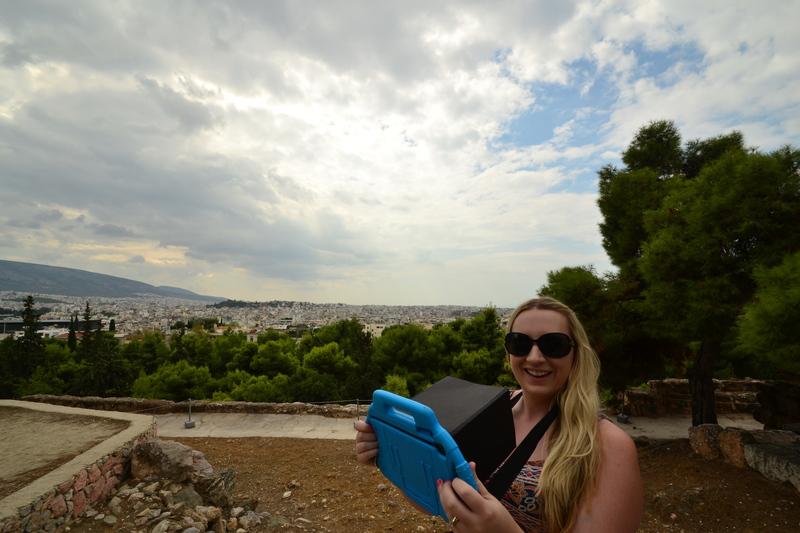 It was an iPad with an app on it that we could carry around and point at the buildings. It would show us what they think the buildings looked like back when they were in their prime. It was awesome! At first, I felt really dorky, but then I embraced it when I saw all the looks on the faces of those without. Everyone was trying to glimpse at our iPads. No, pay for your own tour! Eventually, the tour was over and we were left to explore the Acropolis alone. We wandered around for a bit until our grumbling tummies could be ignored no more. We wandered down to the Plaka district and found a gyros pita shop. I love gyros! For less than 10 euros our bellies were full and we set off on foot once again, exploring the many nooks and crannies of Athens. We ended up wandering through Plaka, through the markets region and eventually came across a Starbucks. They had pumpkin spice in stock which was exciting! Yes. Pumpkin spice features on this blog. After many more hours of wandering the city, it was dinner time. I had a craving for dolmades again, so we searched for a restaurant in the tourist area. Of course, none of them had any! We wandered what felt like hours and eventually came across one restaurant in the markets district in an alleyway that had them. The food was pretty tasty, but a bit overpriced. We ended the night back in our hotel room with a drink or two and some choccie! We only had a day in Athens. I’d read online that Athens was dirty and not worth staying more than a day in. I was upset that I’d believed something on the internet to be true – because of course, for us that was not the case. I would have wanted at least another day to explore the city. Yet again, it’s another reason not to believe everything you read on the internet to be true, especially when it comes to traveling! The breakfast spread that morning was the same as the day before. We ate up and then headed to Syntagma Square underground to catch the train back to the airport. There was a little 11 year old boy (who had an impressive moustache!) playing the accordion through the train busking, and another guy trying to sell notebooks. Everything went smoothly on the ride back, apart from the stench of fish that the old ladies were taking home after a morning at the fish markets. We arrived back at Athens International around lunchtime, in perfect timing for our early afternoon flight out to Santorini – again with Aegean Air. Hi Emma! I love reading your blog and look forward to your new posts. I can’t wait to read about your impressions of Santorini – I went there in 2006 with my family and it was one of the most beautiful places I’ve ever been.